The Swedish language is one of the languages which belongs to the group called the East Scandinavian languages, along with Danish. If you listen to it for the first time, chances of getting overwhelmed are high, but that’s only for the first time. The truth is the Swedish language is one of the easiest Germanic languages to pick up and learn. In fact, Swedish is one of the languages which are considered as English-friendly among Danish, Norwegian, Dutch. Learning the Swedish language by yourself is a doable and manageable task. Getting the feeling stuck is just one of the things you’ll encounter when earning another language. Depending on where you came from, you might find learning the language harder or easier. If you would like to know how to learn Swedish by yourself easier, here are six tips you can follow to improve your learning experience. When it comes to learning a new language, you would likely find yourself memorizing every world you’ll find. The truth is, to master a language, you’ll have to use it more often in conversations with other people. Techniques used in the classrooms, where you learn the color names, counting the numbers, and other basic stuff, will only teach you how to speak Swedish in basic terms. When you want to master Swedish, you need to practice it as often as you can, just like a child learning his first language. Don’t memorize a lot of things at once. Only study the words and phrases used regularly in real life conversations, especially those used when meeting someone for the first time. Learn the words used in your main interests, especially if you see yourself talking about it on a regular basis. Conversations in the meal time and phrases when shopping is needed to get by for shopping your groceries. Knowing the Swedish equivalents for directional worlds are important too for navigating places in Sweden. Words like “tack” and “varsågod” for Thank You and Your Welcome are also basic words that are good to learn first. Learning a language is difficult if there is no study buddy to practice with. If you’re still a university student and is fortunate enough to find a Swedish, Scandinavian, or Nordic Society, join and practice Swedish with them. This is a great way to get exposed to the Swedish culture as well. Swedes are known to have a good grasp of English, so they can talk to you in English perfectly. However, to learn Swedish, you need to practice your grammar and vocabulary. If you happen to find a group where you can learn and speak Swedish, speak in Swedish as often as possible. 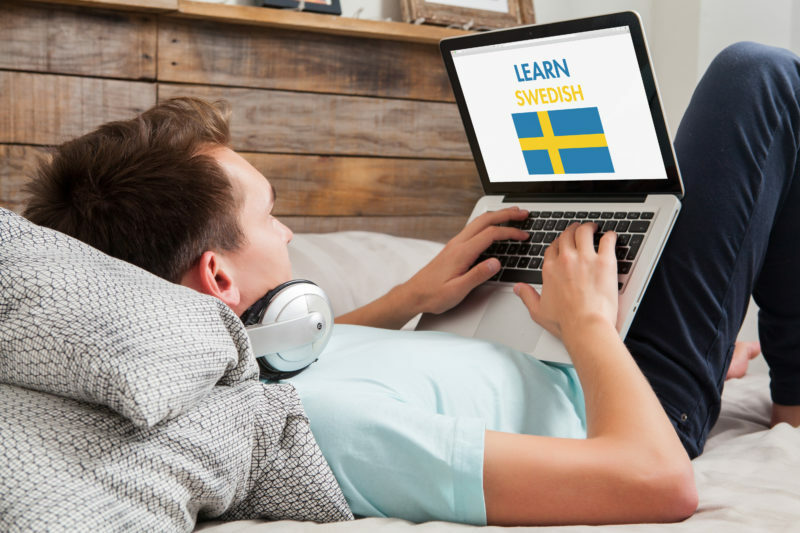 Sure, there are free ways on how to learn Swedish by yourself. However, classroom education should also be considered in learning a new language. Free apps such as Duolingo are useful in grasping the basic phrases, words, and others. Classroom education will give you access to learn with other people and get help when you’re stuck. Going to a class is also a good way of motivating yourself to learn the language. If you can see that you and everyone around you are having progress, this will help you feel worthwhile and motivated to finish the study. Competitive atmosphere is also something you’ll appreciate when you’re learning a new thing. It helps you push yourself to study harder and get better at both speaking and writing mediums. Exposing yourself in the Swedish culture will not only help you learn their language. The Swedish language is a part of the Swedish culture. Understanding the Swedish language is also a part of understanding Swedish culture and its people. Watching a popular Swedish TV program is one of the most effective ways to expose yourself in the Swedish culture. You will be able to pick up new words daily and incorporate what you learn when you try to understand Swedish shows. If you don’t have access to Swedish television shows, you can pick up an English shows that have Swedish subtitles. This practice will also help your spellings and Swedish writings. Another way to expose yourself in the Swedish culture is to add Swedish songs to your playlist. Swedish songs can be found on YouTube or Spotify. Playing Swedish songs will help in working with your vocabulary and pronunciation. These songs and shows will add more flame to your conversation with your Swede study partner if you have any. Immersing yourself with Swedish culture is also a great motivation in learning the language. When learning a language, it is only natural to mispronounce a word, use the wrong word, use a wrong intonation, and overall become incomprehensible. This is a part of the learning curve and will greatly improve your output. Every time your Swede or study buddy corrects you, you improve your vocabulary and is becoming better. To master Swedish, you need to use it as often as possible. You’ll likely make a lot of mistakes, especially if you’re just starting. But if you can weather out embarrassment, you will be able to improve your speaking and reading capability, as well as make some memories to laugh at once you master the language. When you say Germanic languages, these are languages that are spoken mainly in Europe, North America, Oceania, and Southern Africa. English belongs to this group, that is why it is easy to learn other European languages when you’re an English native. Swedish belongs to North Germanic languages, which includes Danish, Icelandic, Norwegian, and Faroese. If you can speak one or two of the listen to languages above, then you will find it easier to learn Swedish. However, people’s learning curve is different from each other. The ability to learn a particular language differs as well from individual to other individuals. If you find yourself stuck in the Swedish language even after getting help, you might want to learn other North Germanic languages first. Learning other neighboring languages might help you in working out your Swedish grammar and spelling rules. In addition, you will also learn an additional language and understand an additional culture. Would it just be a waste of time? It depends on who you ask because as stated before, there are people who find it easier to learn Swedish after learning Norwegian or Danish and vice versa.